Post-traumatic Stress Disorder (PTSD) frequently occurs after the experience of traumatic events such as wars, disasters, acute medical events, and domestic violence. It is known as the signature disorder of combat and disaster. Lifetime prevalence PTSD is substantial, estimated as approximately 8% in the United States, with a prevalence of about 4% in any given year Among U.S. military personnel, frequently exposed to traumatic events, PTSD rates are even higher ranging from 19% to 22%. Military personnel are at higher risk for experiencing traumatic events, including exposure to combat, injury, loss, captivity, and sexual abuse. Consequently, PTSD is a common syndrome among veterans, and is frequently associated with functional impairment. Veterans with PTSD often suffer from a wide range of additional psychiatric symptoms including depression and substance and alcohol abuse. PTSD symptoms are often persistent and disabling unless there is a timely targeted intervention. Symptoms of PTSD are wide-ranging and can affect trauma-exposed people in a number of debilitating ways. They include re-experiencing of the traumatic event (including intrusive thoughts, nightmares and flashbacks), avoidance of thoughts of the traumatic event and people, places, or other stimuli that evokes the trauma, changes in cognitions such regarding the world and yourself, hypervigilance, hyperarousal (including irritability, concentration difficulties, and disrupted sleep), and increases in troubling thoughts and negative feelings. PTSD is commonly associated with functional impairment, substance abuse, suicidal ideation, and increased utilization of medical care. While a number of psychotherapies and pharmacotherapies for PTSD have been developed, research has consistently shown that more than one-third of PTSD patients never fully remit, even if treated. Meta-analysis of psychotherapy for PTSD has found short-term improvements compared to baseline only in about 50% to 60% of patients, with the majority continuing to have substantial residual symptoms. The efficacy of medication in PTSD is also unclear, with a critical lack of advancement in the psychopharmacologic treatment of the disorder. Only 20–30% of PTSD patients experience a complete remission following pharmacotherapy. Importantly, research has shown that among military personnel with PTSD, treatment reach is low to moderate, with a high percentage of service members not accessing care or not receiving adequate treatment. Researchers in the field have raised a call to action to validate novel interventions that will improve treatment engagement and retention among veterans and family members. Here I would like to highlight three promising treatments that may address some of the above problems. Attention-Bias Modification Treatment for PTSD: Emerging research has demonstrated a relationship between biased attention to threat and PTSD. Attention-bias relates to how people focus their attention; research shows that people with high levels of anxiety tend to focus on negative information in their environment. 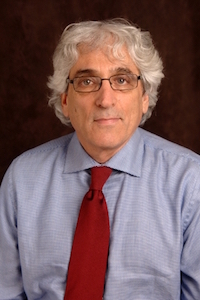 This knowledge has motivated the development of a novel therapy, attention-bias modification treatment (ABMT), currently provided at Columbia Psychiatry thanks to the generous support of SFTT. ABMT is designed to modify patients’ threat bias, i.e., change their attentional habits, with the use of a computer program. Participants with PTSD and attention bias towards or away from threat (documented by the dot probe task) undergo a 4-week (8-sessions) course of ABMT or an inactive Attention Control Program. Findings from this study are about to be published in the near future. Interpersonal Psychotherapy for PTSD: Interpersonal Psychotherapy (IPT) is a time-limited, evidence-based treatment, has previously shown efficacy in treating major depressive disorder and other psychiatric conditions. Rather than focusing on the trauma, as in exposure based treatments, IPT focuses on the patient’s current life events and social and interpersonal functioning for understanding and treating symptoms. This treatment currently provided at Columbia Veterans Center, is a novel use of IPT as treatment for PTSD. Evidence from studies conducted at Columbia Psychiatry suggests IPT may relieve PTSD symptoms without focusing on exposure to trauma reminders. Hence, IPT offers an alternative for patients who avoid or do not respond to exposure-based approaches. Interpersonal Psychotherapy focuses on two problem areas that specifically affect patients with PTSD: interpersonal difficulties and affect dysregulation. The treatment help the patient identify and address problematic affects and interpersonal functioning, and to monitor treatment response. Equine Assisted Treatment for PTSD. Equine-Assisted Therapy for PTSD (EAT-TSD) is a unique, group treatment that might reduce symptoms of PTSD, particularly individuals who encounter difficulty in more traditional treatments. In EAT-PTSD, a mental health professional and an equine specialist work together to guide participants with PTSD through a series of structured activities with a horse. Presently this treatment is studied at Columbia Psychiatry as part of the Man O War Project . It is an eight-week study aimed to examine how well EAT-PTSD works for veterans with PTSD. Treatment groups consist of 4-6 veterans at a time. 90-minute EAT sessions take place at the Bergen Equestrian Center in Leonia, New Jersey. Columbia Psychiatry provides transportation to treatment sessions. Treatment does not include riding horses. Through various interactive exercises with the horses, the veterans learn how their actions, intentions, expectations, and tone have an impact on their relationship with the horses (and ultimately with the people in their lives). 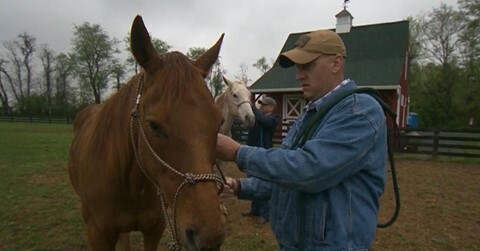 Over the course of treatment, the equine specialist and the mental health professional assist veterans in drawing connections between what the horses may be doing, thinking, or feeling, and their own PTSD symptoms, increasing emotional awareness and ability to regulate emotions and behaviors, and learning to more effectively interact with the horses, and by extension other people as well.